TNT-Audio has already reviewed Cambridge Audio products, namely the D 500 and the D 500 SE CD players. Hence, for more info on this UK-based Company, I'd suggest reading those reviews and/or visit the official website. Cambridge Audio makes two integrated amplifiers, the A 300 and the A 500 RC under test (where RC stands for Remote Controlled). These two amps have been around for a while, something I appreciate since customers are not forced to buy a new model every year or so. This also helps keeping a high second-hand value. The A 500 RC is an integrated amplifier, quite powerful for the price (65 watts per channel @ 8 ohm and 85 @ 6 ohm), equipped with several inputs (6 gold-plated RCA line inputs, phono stage on demand) and a good number of features which also include tone controls (ha! ), double bi-wiring ready binding posts and a pre-out output for external amping (or bi-amping). The binding posts follow the strict CE safety rules so they don't have the usual hole for banana plugs but thanks God the holes for bare wires are large enough to allow a banana plug to be secured to them. As usual with Cambridge products, the writings in the rear panel are "upside-down" so to make reading far easier, for example when installing cables from above. The AC mains cable is detachable thanks to an IEC socket (good for mains cable upgrading!) while the cabinet is dampened only via four plastic/rubber feet (the same as in the D500 CD player). The (included) SRC-01 remote can control many different Cambridge products (CD player, tuner...even lights!) but, alas, only the volume control on the amp. You can't switch the inputs nor turn on/off the unit. Volume, up and down, and that's all. The Cambridge A 500 looks very classic with its aluminium black fascia and a large, centrally positioned, volume knob. This no-frills approach should allow the designers to concetrate on good sound only (hope so). Tone controls are of the "audiophile" kind in the sense that their job is limited to a ± 6 dB area and they can bypassed via a "direct" switch for better sonic performance. Tech specs claim a frequency response extended from 25 Hz to 60,000 Hz with a -3dB decrease. The power stages make use of two pairs of Sanken SAP-15 devices (one pair per channel) while the power supply section makes use of a real toroidal transformer (not like the "fake" toroidal into the D 500/D500SE CD player) with no metal shield and 4 filtering CapXon caps per channel (2200 uF each, 8800 total per channel). The volume pot comes from "Soundwell" and is connected to a small motor for remote control operation. The Cambridge A 500 RC is standardly sized at 43W x 30D x 9H cm. while it is a bit lightweight, considering the claimed power output. Designed and engineered in the UK, the A 500 is actually made in China. I've tested the A 500 with different partners and even into two different listening rooms. Now close your eyes and listen: if you're familiar with the Cambridge Audio sound you will tell this is one of their amps within few seconds. Undoubtedly, the usual sonic signature of the UK firm is here and this means the designers know exactly where to go and HOW to get there. Hence, you get the usual soft and warm sound I've described when reviewing the D 500 and, again, that kind of slowness that so heavily affected that CD player. I'll tell you about this peculiar aspect later. Now let's concentrate on tonal balance. The Cambridge A 500 is warm and even a bit "loudness-like" with highs and bass slightly protruding over the midband. Actually, the midrange appears somehow recessed and shy, just to add that touch of smoothness often lacking in entry-level audiophile-oriented products. The high range appears quite detailed, even if not so harmonically rich, and rather clean, considering the prige tag of this amp. Its major fault lies in the trasition region with the mid range: sometimes the amps sounds edgy in this area or, better, a bit "acid". Not metallic nor harsh, still quite disappointing especially with voices, which is a shame, considering the general character of the unit. In few words, it is not completely coherent and natural. As said, the midrange is quite below the rest so the "being-there" effect isn't as one would expect. For example, Courtney Pine's sax on "Courtney blows" (Soul II Soul, "Vol II, A new decade" Virgin 91367-2) is not the "leader" of the track, as it should be. That metallic note that helps distinguishing a real sax from a synthetic (electronic) one is completely missing here. Courtney blows...but with this amp it rather seems he's just hitting keys on an electronic keyboard. Voices are not bad at all, just a bit thinner than usual. Choirs appear to be quite small and way below the soloist. Actually, this amp tends to be smooth even when it shouldn't, for example when playing Bob Dylan's voice. Now, we all know he is not like Pavarotti but his voice has something harsh and peculiar that makes it unique and unforgettable (and fascinating, I'd dare to add). Dylan's songs sung by better vocalists always turn out to be a complete disaster and nonsense, indeed. Take, for example, "Highway 61 Revisited" (audiophile edition by DCC Compact Classic, CD 24 kt Gold, GZS-1021). Here percussions and cymbals appear clearly above the rest and so the upper portion of Dylan's voice. The "body" of the voice is somehow lacking and, overall, it seems Bob took a shower with Coccolino (Coccolino - Cajolin in French - is a very popular product for washing machines. It adds that silky touch to your underwear :-)). Silky, too silky, definitely too...silky. Dylan's voice ain't so. As another clarifying example let's take Music where acoustic and electric guitars play a major role. Since the A 500 never wants to appear aggressive, the natural metallic sound of guitar strings becomes smooth and tender...as it shouldn't be. I'm referring, for example, to "The Major of Simpleton" (XTC, "Oranges and Lemons" Mobile Fidelity OMR UltraDisc 24kt, UDCD 682), a track where the whole harmonic structure is based on Andy Partridge's guitars. The A 500, instead, seems to prefer cymbals and electric bass. The same happens on "The Loving" (still the same CD) where the quite intricate guitar structure lacks verve and magic. You get the big picture, missing some interesting and intriguing detail here and there. Switching to some Classical Music, the softening effect is self-evident with violins, which appear mellow and silky even when they should scratch...if you've listened to REAL violins in a LIVE environment you know what I mean. Generally, instruments like trombone's and trumpets seeem to lack, again!, that metallic note they have, a note which helps detecting them even during a large orchestra fortissimo. Once again, even with large orchestra, you get a big picture but when you try to zoom in to detect single sections or instruments you find yourself wondering where are they hiding. A special paragraph is devoted to the bass range. Here the "body" of the Music unexpectedly reappears, thanks to a powerful and gutsy performance in the region between 50 and 150 Hz or so. It is clear, in my opinion, this peculiar aspect, i.e. high concentration of energy in this area, has been one of the designer's main goals and later on I'll try to explain why. This energy of the bass range decreases rapidly below 50 Hz and it shouldn't come as a surprise the claimed frequency response datum (-3 dB @ 25 Hz!) can be easily confirmed by listening to pipe organ good recordings. As an example, consider the 30 Hz opening pedal in Strauss's "Also sprach Zarathustra" (Telarc edition, André Previn - Wiener Philharmoniker - CD 80167): to detect it you need to turn the volume so high that the subsequent crescendo becomes unbearably loud. Generally, the rest of the bass range is rather boomy and often out of control but, these complaints aside, it helps adding muscle and weight to the sonic balance of this integrated amp. Now let me try to explain why this amp sounds the way it does. The Cambridge A 500 RC is an audiophile-oriented amplifier, aimed to buyers on a budget willing to build a decent sounding HiFi system for less. Predictably, this amp will drive a pair of inexpensive bookshelf loudspeakers and, these, generally, sound a bit shouty and edgy in the mid-high range, so to impress during fast A-B comparison tests. Plus, these speakers, because of physical limitations (small sized woofer and cabinet) will have a bass range that can't be defined earth-shaking. Introducing you the A 500, the ideal partner for these guys: smoothing the mid-high range and improving the bass near the "punch" region (100 Hz) it helps to rebuild a reasonable tonal balance. Below 50-60 Hz - where speakers of that kind cease to play :-) - the A500 smartly saves fuel as its efforts into the first octave region would result completely useless. This choice is indeed a winning one, since the majority of inexpensive bookshelf loudspeakers are of the kind described above. Anyway, when the loudspeaker has the very same tonal balance, guys you're in for trouble. Indeed, a careful amp-loudspeaker matching has to be taken into serious account before buying. Also, that aforementioned "acid" note in the mid-high range can perfectly match a similar one from the speakers. For example, I've heard the A 500 sounding pretty unpleasant when matched to a pair of B&W 602 S2 loudspeakers. One thing is for sure, this amp can smartly fascinate - even NOT at a first, quick audition - the beginning audiophile whose ears have ben splitted by lesser consumer gear. The trained ear, though, can immediately detect the compromises which have been done and find some aspect of the sound of this A 500 quite unpleasant and unsatisfactory in the long run. This doesn't really matter, actually, since the A 500 RC has precise goals in mind (as explained above) and knows how to reach them. Considering the already cited "smoothing" effect this amp applies to Music, it shouldn't come as a surprise that it lacks energy and violence when required. Oh yes, it can play loud, louder than your neighbourhoods will ever allow you to play :-), but sound pressure isn't everything. When forced to quickly jump from pianissimo's to fortissimo's the A 500 slows down, hits the brakes and leaves you wondering where the sheer energy of some Musical genre has gone. Speed and "bass kick" are not among its forte's. Still lively and quite enjoyable with relaxed Music it fails to reproduce a realistic drum kit, for example. When the kick drum is hit, you should be able to hear the attack (the crashing sound of the kick pedal hitting the drum) and subsequently the boom (or thump, depending on the kind of drum and recording technique). With the A 500 the initial attack of the pedal is slow and mixed with the subsequent bass boomy note. Sometimes you start to think the drummer is playing a rubber drum kit. Nonetheless, the Cambridge A 500 RC is perfectly adequate with modern Music and performs proportionally better than its cousin D 500. Slowness is still there but it is definitely more bearable. Its slowness becomes pretty evident when comparing the A 500 with similarly priced amps gifted by a more "muscular" performance (Rotel and NAD come to mind). To crarify a bit more, I'm referring to the sheer violence you need to adequately reproduce tracks like (guess what?) "TNT" (AC/DC "Live" Atco Records 7567-92215-2) where the power chords played by Young brothers' guitars should literally explode into your listening room. In the microdynamics department the Cambridge A 500 RC performs reasonably adequate, at least with small acoustic ensembles and easy listening jazz or blues. The attitude of hiding a portion of the midrange doesn't certainly help here and when Music becomes "intricate" the A 500 tends to create a sonic amalgam that is quite hard to analyze. Thanks to the behaviour in the mids, the depth of the 3D soundstage is surprisingly big. Indeed, you get a 3D image which is quite large and unexpectedly deep, considering the price tag pf this amp. The height of the virtual scene is sufficient and certainly adequate to what one expects from this kind of budget-oriented units. The real problem is the focus of this quite large image. "Blurred" is the first adjective that comes to mind when trying to locate instruments and singers into the 3D scene. Even left-right separation is questionable since "ping-pong" effects are not so fast and precisely located as they should be. No, I'm not saying "ping pong" effects are something good, these are actually a silly heritage from the early days of stereo, but they are tremendously useful to detect channel separation problems. Perhaps the real culprit isn't channel separation (which I assume to be good) but the natural slowness of the amp, being unable to instantaneously follow crisp variations of level (fast left-right moving sounds, for example). Nothing to remark: the Cambridge A 500 is easy to use and user-friendly, it can drive even low-sensitivity speakers (though output binding post suggest a minimum load of 6 ohms) and it plays right without the urge of finding the perfect position, the perfect feet or cables. I'd suggest to use a good mains cable (of the DIY kind, for example) and adequate speaker cables and interconnects (better if fast and dry in the bass). As for feet, try using something softer (I've successfully used SonicDesign damping feet. The pre-out output is, in my humble opinion, completely useless since when an upgrade is needed, one should think to buy a new amp. The Cambridge A 500 is quite silent (no buzzes or noises when on) and it just makes a slight "bump" when switching it on and off. This doesn't harm the speakers. As usual, the cabinet is quite resonant and wimpy, the binding posts are too close one to the other and, even worse, the "suggested" ones for monowiring are in the second row (that below the first one :-)). This makes connecting cables a bit trickier than usual. I'd suggest to use the first row even for monowiring, since the two sets of binding posts are connected in parallel via a metallic strip. If the first row sounds worse (according to Cambridge designers) why should one use biwiring and degrade the signal feeding the tweeters (or the woofers, depending on your choice)? Funny question. The SRC-01 remote control is totally useless if one doesn't own a complete Cambridge system. After all, it can only control the volume of the amp. The phono stage is available as optional (at an extra cost) and the headphones output jack is missing. Sonically, the Cambridge A 500 does nothing to hide its personality. A bit too soft and warm to suit my taste, it lacks authority and slam, depth of bass and focus. It is a bit inconsistent but it can work as an ideal partner into budget systems as explained above. Considering the high power output (65 watts per channel) and the features it offers, I'd consider the quality/price ratio quite high. 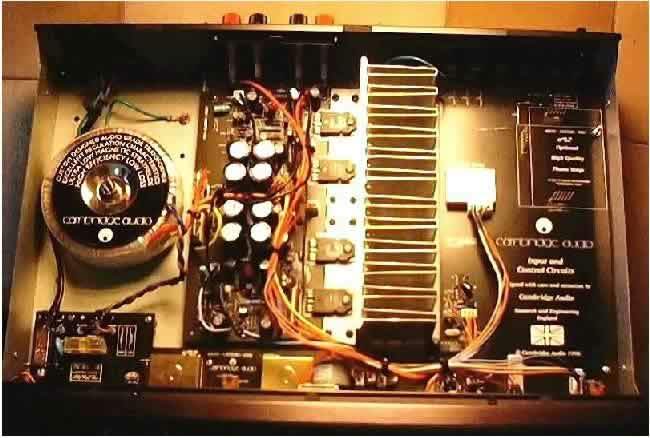 The Cambridge A 500 RC is an integrated amp that can sound quite differently from its competitors. If you're looking for a warm and relaxed performer for a budget system, you should take the A 500 RC into serious account. If you're looking for a dry, fast and crisp "power generator" for your speakers, you'd better look elsewhere. ...when their logic grows cold and all thinking gets done, you'll be warm in the arms of the Major of Simpleton.